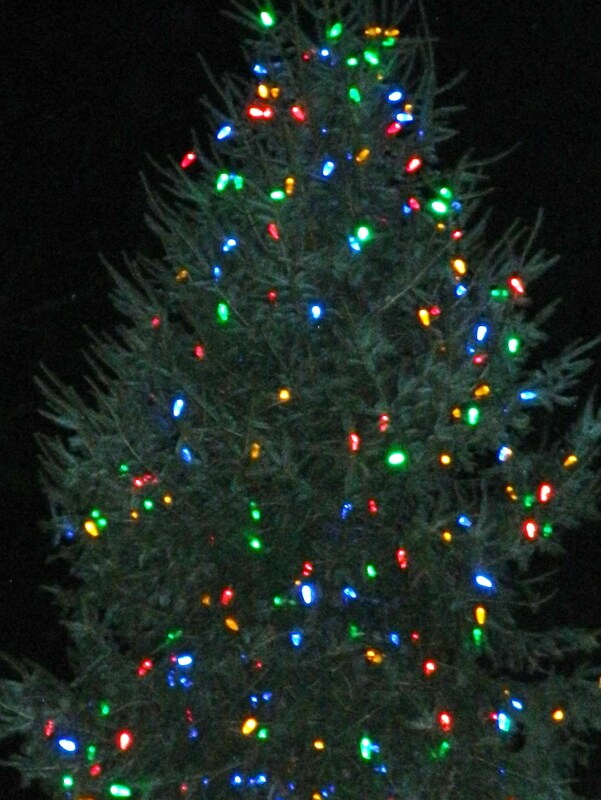 A 20 foot Balsam fir was donated by Jeff and Dianne Hedrick for the annual Tree Lighting in Downtown Manchester, Connectiuct. Jeff and Dianne Hedrick were presented with a 2013 Manchester Historical Society ornament. The Christmas season was welcomed into downtown Manchester, Connecticut December 5 with the lighting of a new tree donated by Jeff and Dianne Hedrick. A twenty foot Balsam fir, it replaces a once 37 foot Norwegian spruce that had to be removed after Hurricane Sandy hacked several feet off of it last year. However, left without time to find a different tree for the 2012 holiday season the Downtown Manchester Special Services District decided to decorate the sparse tree and it was dubbed a ‘Charlie Brown Tree’ borrowing from the famed Peanuts series. The ‘Charlie Brown Tree’ drew more than the usual attention to the annual event. Arrival of the new tree just over a month ago also made headlines and attracted crews from television stations that cover the state. Picked from more than fifty prospects, the Balsam fir has a story of its own which was shared during the Thursday night Tree Lighting ceremony held in front of St. James Church. The Balsam was given as a condolence gift to the Hedricks sixteen years ago by their neighbors Prescott and Martine Lehmann, owners of Hickory Ridge Farm in Coventry, to help them get over the the loss of a cherished pet dog named “Crackers.” Through the years watching the Balsam grow and then decorating it in their front yard is said to have brought the couple comfort and joy. 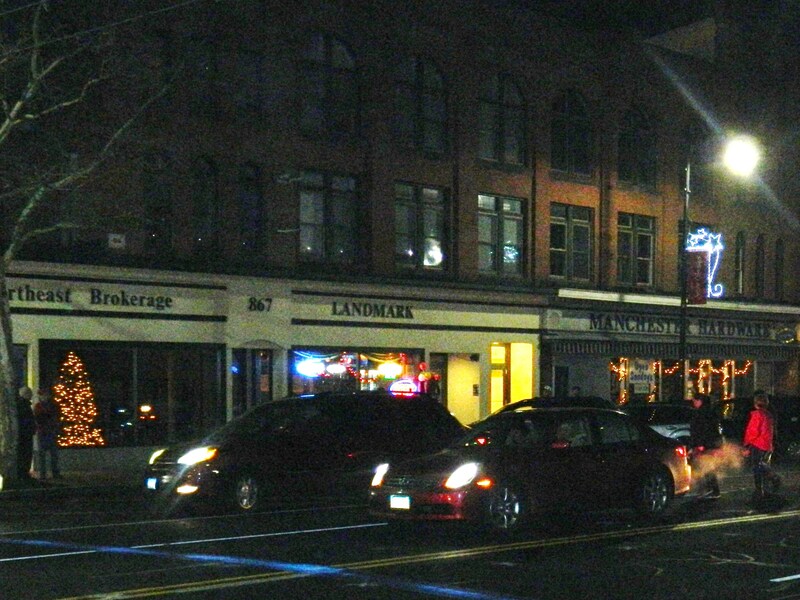 Downtown Manchester bustles during IMAGINE Main Street activities. Silk City Barber Shop Chorus. 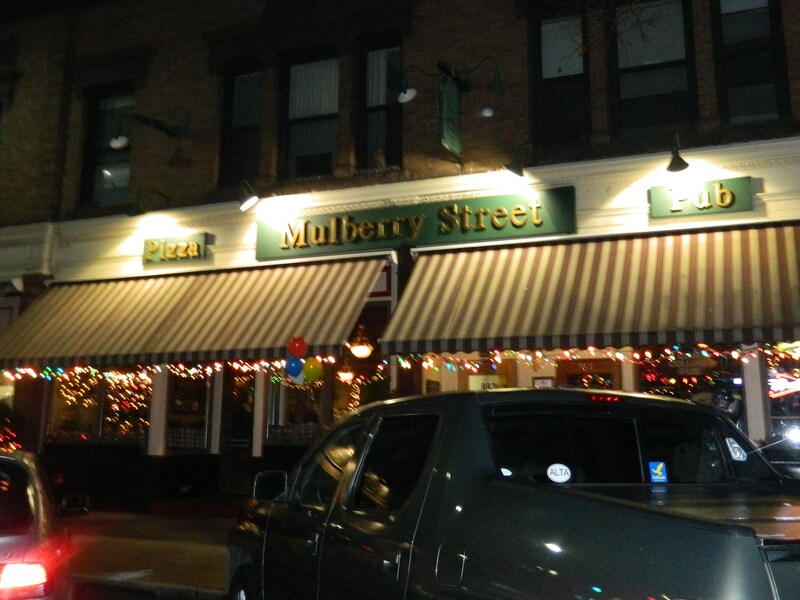 It’s ‘happening’ at Mulberry Street! Upon learning of the need for a new tree in their old hometown, they made an offer. 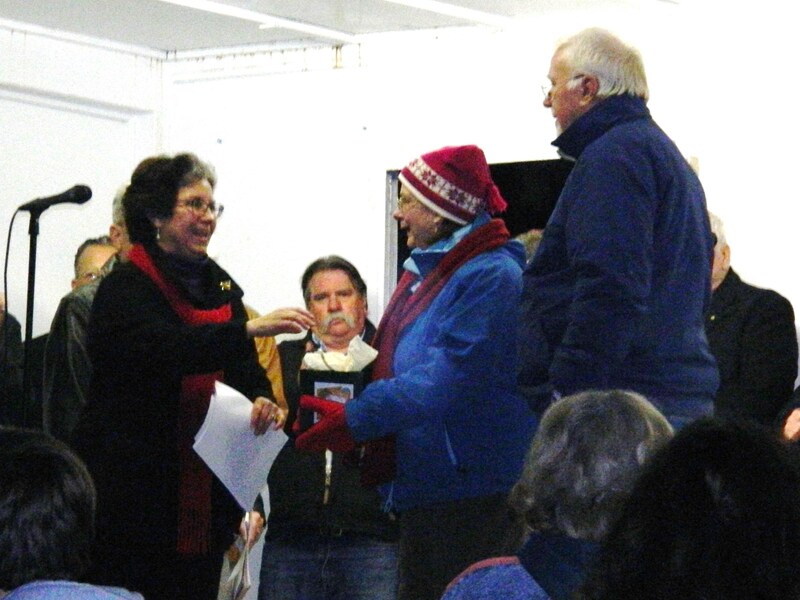 According to the event program, it was chosen based on “size, shape, condition, access and distance from the Downtown.” In recognition of their generosity the Hendricks were presented with a 2013 Manchester Historical Society ornament. As well, certificates of thanks were given to representatives from Crusin’ on Main Street and the Manchester Rotary Club that between them donated more than $3,000 to pay the cost of transporting the tree to its new home. Mayor Leo Diana thanked event sponsors. Sportscaster Scott Gray, a Manchester native served as Master of Ceremonies. 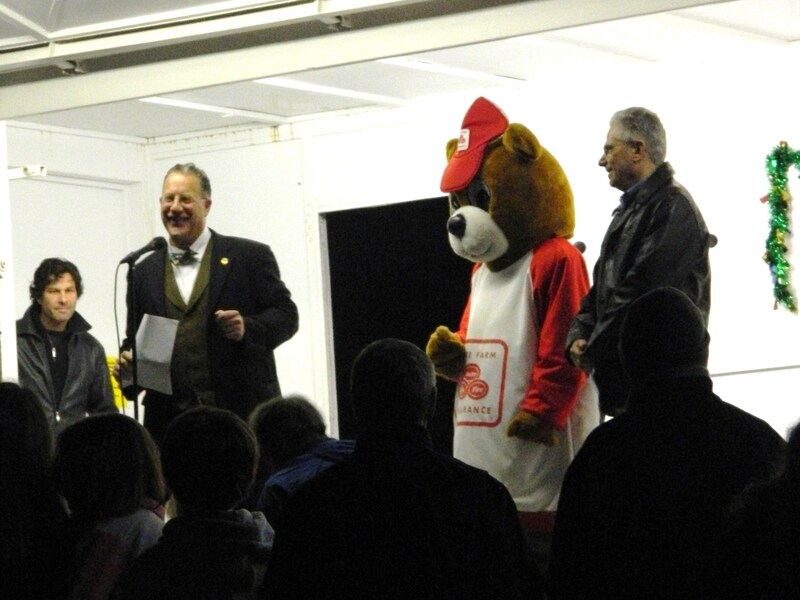 Mayor Leo Diana made special mention of StateFarm insurance as a major sponsor of the event. Ensembles from the Manchester Citadel Band of the Salvation Army, Summit Singers and Silk City Barber Shop Chorus led the crowd in singing holiday songs before the lighting of the tree and arrival by firetruck of the jolly ole’elf himself – who obviously must have dashed to be there before a quick return to the North Pole in preparation for his upcoming big night. 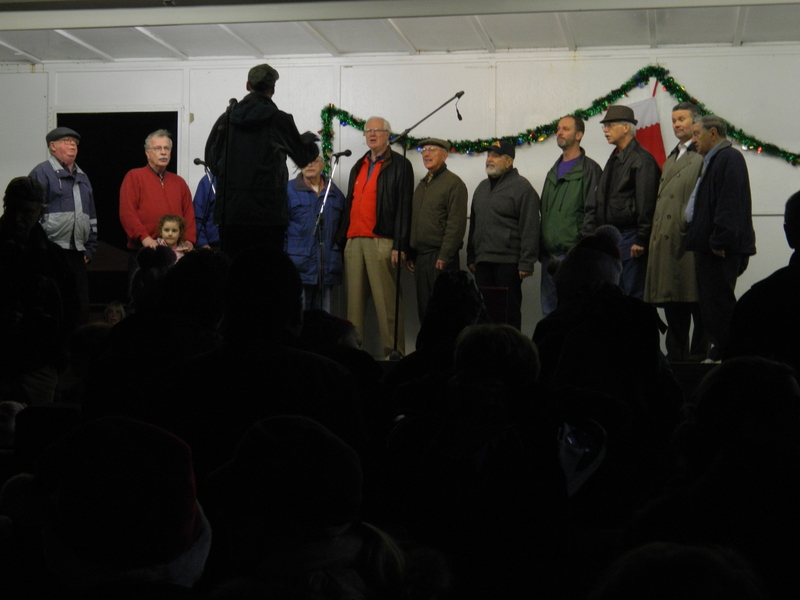 The Tree Lighting ran concurrently with IMAGINE Main Street activities – visit http://www.imaginemainstreet.com to find out more.